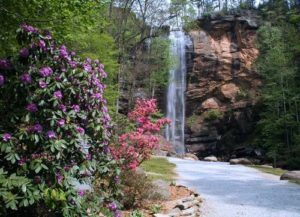 If you are looking for the perfect destination for your retreat, summer camp, conference, or meeting, the campus of Toccoa Falls College is the perfect place! We have many different ways in which to accommodate your group as well as a beautiful location. Various Other Classrooms: There are other various classrooms that are made available for camps to use as needed. They are Bandy Hall (seats 90), 4 classrooms in the Ministry and Leadership Department, M107 (seats 50). Intramural Field: Toccoa Falls College has an intramural field between the gymnasium and Grace Chapel Performing Arts Center that can be used for all sports; i.e., football, soccer, recreation time, etc. Lois Delany Gym: The gym features two full-size basketball courts with a beautiful floor and score boards. Sand Volley Ball Court: There is a Sand Volley Ball Court located by the pond area. Creek-side Park: There is a fire-pit located at Creek-side Park. You can make use of the fire-pit but be sure to mark this on the form. This area can be used for small recreational games. Camp Staff Office: There is a large room behind Grace Chapel Performing Arts stage area (in the music wing) that is made available for the camp staff to use if needed. This space can be used to store any recreational equipment, for your meetings with your leaders, for your own personal office space. The first and second floors of LeTourneau Hall are laid out as a community-style residence, with bathrooms located at the end of each hall. LeTourneau Hall is set up in a unique fashion, with all of the student rooms opening into a large central lobby. Every room on both floors is visible from the lobby, creating an unparalleled sense of community. The basement of LeTourneau Hall contains suite-style rooms and an extra-wide hallway that serves as a sitting area. 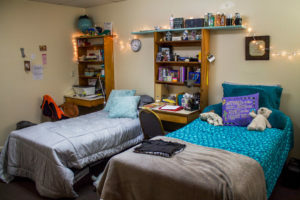 Fant Hall: Features suite-style rooms with a bathroom joining the rooms on either side. Forrest Hall: Is divided into three wings, forming a T-shape. A-wing and B-wing are community style rooms with bathrooms located at the end of each hall. C-wing has suite-style rooms. Terraces: We have several one-story cottages that consist of 3 bedrooms & 2 bathrooms on each side with a small living area and kitchen. We also have two-story cottages that consists of a total of 24 beds each with 4 living areas each and 4 kitchens each. There are also 2 bathrooms in each area. Camps & Conference Coordinator: My office is located in the music wing of the Grace Chapel Performing Arts Center. I book all of the camps located on the campus of Toccoa Falls College. If you are interested in booking your camp on our campus, just use the Camp Information Form on this website and I will be in touch with you. Camp Monitors: The Camp Monitors are all TFC students who work directly under the Camps & Conference Coordinator for TFC. They live in the dorms and are there to help and assist you in your designated living area. They are also assigned to help each camp with any needs they may have. This includes placing ice filled water coolers in all areas of campus you may be using for the day, assisting you in any recreational needs and monitoring any other needs that may arise. Admissions: Admissions is always ready and willing to speak to any camp that is on our campus. They will give group/camp/individual a tour that would like one. They will often have give-aways also. Please make sure you mark on the form that you do want Admissions to speak to your group. This is held in the lobby of Lois DeLany Gymnatorium. Check-in cannot begin earlier than 1:00 p.m. The Camps and Conference Coordinator of Toccoa Falls College along with the assistant will take care of your housing assignments, keys, and meal bands. Medical Emergencies: Toccoa Falls College DOES NOT have a nurse available for camps and conferences. 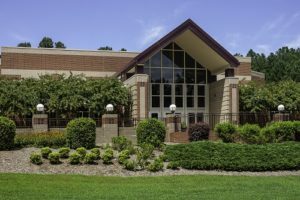 Stephens County Hospital is located at the entrance to Toccoa Falls College. Proof of Insurance: All camps have to show proof of insurance by submitting a copy of their insurance to Camps & Conferences with their signed contract. Click below to request more information or reserve your space today!